A dramatic restriction of live cattle imports to Indonesia in this quarter may not be the final word, says Tracey Hayes, CEO of the Territory Cattlemen’s Association. In any case, fewer than 10% of cattle from Central Australia go to that country while our principal live export destination is Vietnam. Also, the domestic market remains strong, she says. Ms Hayes (pictured) says the announcement to cut numbers from 250,000 to 50,000 was made during the Islamic month of Ramadan which ends on Friday. This period of fasting is followed by a week-long festival of Lebaran, marked by “abundance of foods and delicacies served for visiting guests, family, relatives, neighbors and friends,” according to Wikipedia. Business as usual follows that. “We will assess the situation then,” says Ms Hayes. It is possible that the numbers announced were for the beginning of the quarter only. At the same time, seeking diverse markets overseas needs to remain high on the agenda, she says. 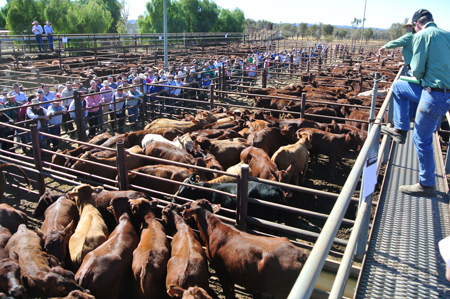 PHOTO: The recent Alice Springs cattle sale. @ Hal: Have we forgotten that a couple of years ago, the live export was cancelled by Australia, due to cruelty during slaughter? This was clearly shown by Four Corners. There are more markets than Indonesia. Of course at the moment there is a surplus of cattle due to Ramadan. And in relation to the Halal, this is BS, especially when it is a tax placed on our foods. What a rort. Who is it exactly that you want our food animals sold to? The Arabic word halal means permissible, and the rules of slaughter are based on Islamic law. The animal has to be alive and healthy, a Muslim has to perform the slaughter in the appropriate ritual manner, and the animal’s throat must be cut by a sharp knife severing the carotid artery, jugular vein and windpipe in a single swipe. Blood must be drained out of the carcass. Contrary to what many assume, most animals killed by halal methods are stunned before slaughter. FSA estimates suggest that 88% of animals in the UK killed by halal methods were stunned beforehand in a way that many Muslims find religiously acceptable. The Jewish method of slaughter called shechita cannot involve pre-slaughter stunning at all. There are a small number of abattoirs in Australia that have been granted permission from the relevant State or Territory food authority to conduct religious slaughter without prior stunning – for either Halal or Kosher (Jewish slaughter) purposes. These “approvals” are effectively exemptions to standard Australian slaughter practice. Re Robinoz: Been in business long? Good news. I’d prefer to see our meat sold to non-moslem countries where halal slaughter is not practised.